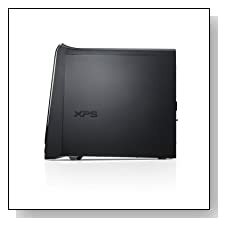 Dell XPS X8700-1261BLK is a top level fast and powerful desktop PC with a Haswell i7 processor, 8GB memory, 1TB hard drive, NVIDIA GeForce GT 720 graphics and Windows 7 operating system that can handle anything you throw at it, including the latest games at high settings, multimedia editing, intensive business applications and all the multitasking you want. Dell XPS X8700 has a 4th generation Intel i7-4790 processor at 3.6 GHz speed that offers fast and smooth performance with also the 8GB DDR3 SDRAM (2 DIMMs) at 1600 MHz that can be updated to a maximum of 16GB if you want more memory for multitasking of your even more demanding programs but quite sufficient as is for most people, 1 TB hard drive at 7200 RPM as ample storage space for all your regular files and photos, songs and videos and 50% faster read and write times. The i7-4790 performs about 15% better than the 3rd generation Ivy Bridge i7 with mainly its raw clock speed advantage and consumes less power. Many computer users still prefer the Windows 7 to the latest Win 8 and 8.1 as a more stable platform and the familiarity factor: This is what you have on the XPS-X8700, the 64-bit Home Premium version of Windows 7. It comes with an NVIDIA GeForce GT 720 dedicated graphics card with 1GB of RAM for great gaming and video editing performance and you get to watch movies and play games with great clarity, richness of images, fine detail and vibrant colours. The built-in HD 7.1 Performance Audio and the Waves MaxxAudio 4 software will let you hear amazing studio quality sound with the right kind of speakers in videos, songs and games. 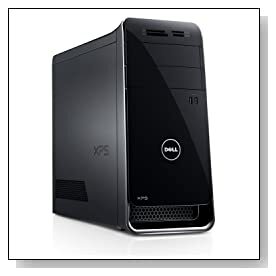 Black Dell XPS X8700 has the measurements of 22.52 x 14.49 x 20.94 inches. There is obviously no monitor but comes with a wired Dell Multimedia Keyboard and a wired Dell USB Laser Mouse as well as a great variety of connectivity ports, including a total of 10 USB ports- 6 x USB 3.0 and 4 x USB 2.0, Dell Wireless N 1703 802.11a/b/g/n wireless, Bluetooth 4.0, Gigabit Ethernet with RJ-45, Media Card Reader that supports 19 formats, 16X CD/DVD burner (DVD+/-RW), 1 x Audio-out port and an HDMI port to connect to your HDTV. Conclusion: Dell XPS X8700-1261BLK is a powerful desktop with one of the highest grade processors on the market, good amounts of system memory and storage, an advanced NVIDIA GT 720 graphics card for the best video and game performance, a superb sound system as well as a decent variety of connectivity options including 10 USB ports. You won’t have a problem performing your most demanding tasks on it on a day-to-day basis and play the latest extreme games at higher settings or edit videos and HD video playback. It comes with a limited parts and labour warranty of 12 months and the best customer service by Dell. You’ll experience great performance and multitasking overall with raw clock speed CPU and 8GB RAM, reduced energy consumption (having a Haswell processor) and a multiple display capable iGPU. Well worth its price for those that need a high power computer with bells and whistles and not for those that just want a computer to perform your basic daily tasks or browse the net and they may want to have a look at alternatives on the Amazon Search that will also appear through the link below.